The microwave has an extraordinary number of uses that goes above and beyond reheating your cold leftovers from last night's dinner. For food-related uses, the microwave can also make your lemons more squeezable for maximum juice output, roast garlic heads, decrystallize hardened honey, dry up fresh herbs, and more. As for completely non-food-related uses, the microwave can sterilize your garden soil for starter seeds, dye fabric, and if you want to get super-creative, melt your broken crayons so you can mesh them together into one giant super-crayon of multiple colors. Pretty amazing for a humble kitchen appliance that is usually associated with TV dinners and hot pockets. 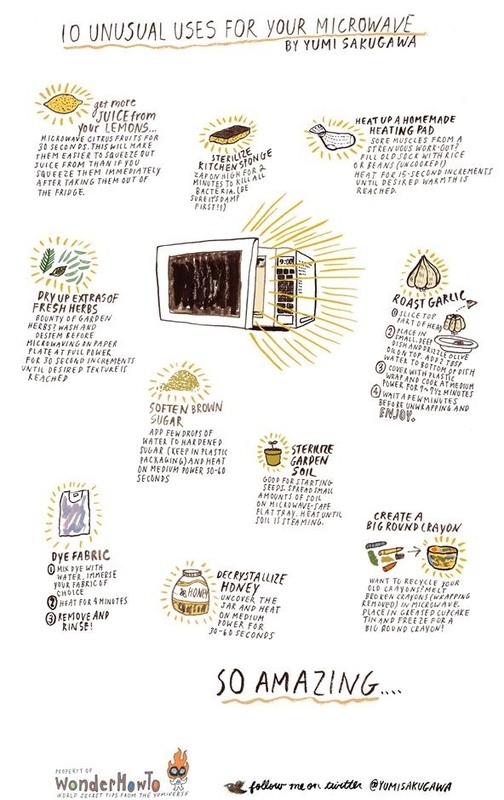 Got your own favorite unconventional uses for the almighty microwave? Share with us in the comments below! How To: Make a Brownie in a Minute! This is a really good article. I never knew that a microwave oven could do what you have enumerated in your illustration. Thank you for sharing!